Absolutely beautiful all original antique aesthetic era sterling silver locket bursting with Victorian sentiment and romantic symbolism. One side is engraved with a graceful swallow flying through a meadow with the other decorated in a pretty pattern of forget-me-not flowers and stylized ivy. 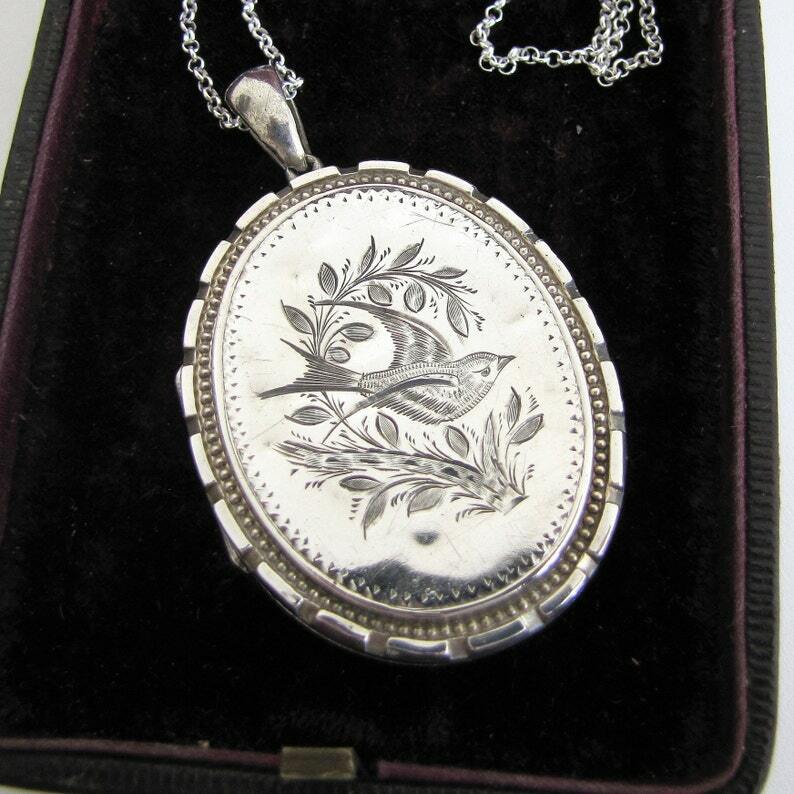 To the Victorians the swallow, a bird that mates for life, was a symbol of enduring love and loyalty and the ivy represented eternity and fidelity so these romantic silver lockets were often gifted to fiances and brides. This is a particularly nice example, a large impressive size the engraved decoration is framed with lines of milgrain surrounded by a decorative cut out edge. The locket is further enhanced with softly contoured large teardrop bail. One side features a scroll shaped blank cartouche should you wish to have it personalized with an engraved name or initials. The locket opens to reveal the original removable silver picture rings along with red felt and cream satin liners so it looks to have never held photos. The inside is even decorated with applied silver cut outs in star shapes, fine quality and super attention to detail! We have added a new 18" sterling silver Belcher/rolo chain that is perfect for wear with these Victorian lockets. With it's elegant round links the treasured belcher chain remains one of the most enduring antique style chains still available and ours are fully hallmarked, made in the UK and high quality. A truly exquisite Victorian locket necklace bound to bring endless joy to its new owner! HALLMARKS: None visible, tested as Sterling Silver throughout. CONDITION: Excellent condition with minor signs of surface wear to be expected from a piece of jewelry this age, any dark marks are camera shadow. The original picture rings and liners are present and the hinge is in perfect working order with the locket staying firmly closed. There is a spot of old glue residue on the inside that can be easily removed should you so wish. Antique Gold Gilt & Enamel Mourning Locket/9ct Chain. Victorian Scottish Photo Locket, Double Sided, Engraved "M" Luckenbooth Heart Locket. Victorian 15ct Gold Etruscan Locket Back Pendant. Antique Gold, Enamel, Pearl Mourning/Sentimental Pendant Locket, Hair/Photo Compartment. Antique Gold Mourning Locket. Machine Turned Pocket Watch Style, 9ct Dog Clip. Victorian Memorial Locket, Sir John Guise, Baronet 1865.